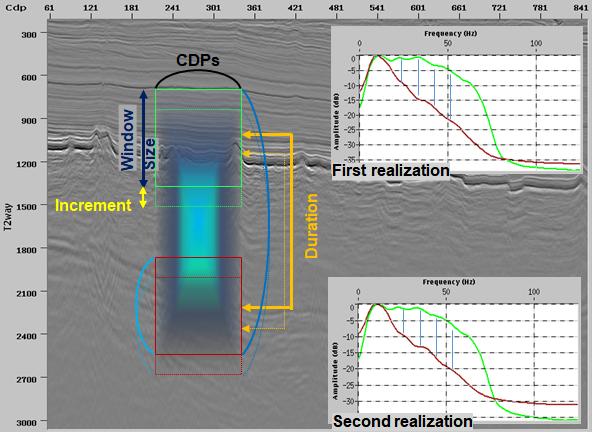 The Q Estimation module is designed to estimate a time and space variant effective Q field from a seismic section, using the spectral ratio method applied to trace segments transformed into the frequency domain. Estimation of the quality factor is performed by comparing the local weighted average amplitude spectra of two consecutive windows, which are both tapered before a fast Fourier transformation. Then for a given time duration, we find out how rapidly the logarithm of amplitude decays with respect to frequency. Plural realizations of inverse Q values are then weighted, tapered and distributed in the corresponding zones. A normalized weighted average of plausible values is then computed for each time sample. Figure 1 explains the approach used in the Q Estimation module. The Q Correction module is designed to reverse the effect of viscoelastic wave propagation on both amplitude and phase of seismic reflection data, i.e. attenuation and dispersion. The aim of the inverse-Q operation is to increase the resolution of the final image. This is achieved by boosting the attenuated high-frequency signals, while reducing the small travel time variation between low and high frequencies. 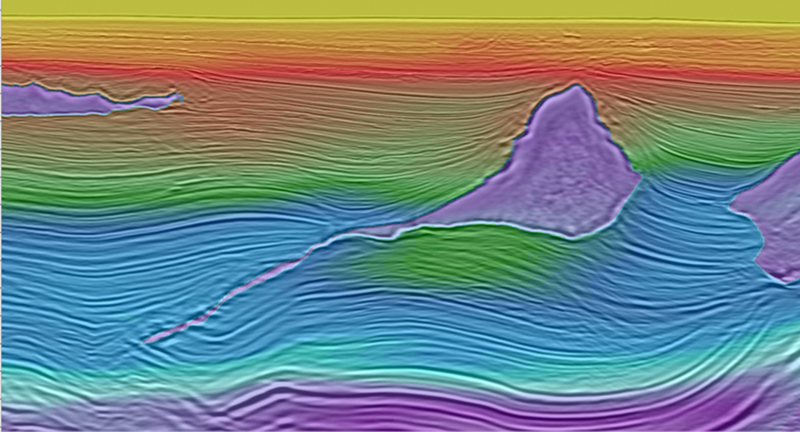 This correction can, therefore, reduce the mismatch between the recorded seismic data and the synthetic data from the well logs. In this module, every input trace is divided into a number of overlapping segments, which are tapered and transformed into the frequency domain. 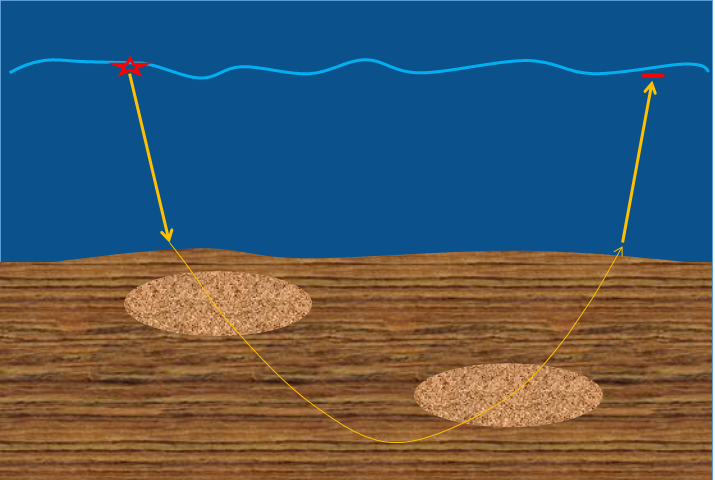 Based on the offset and arrival time of every segment, using a velocity field and the water bottom times, a basic ray tracing is performed to work out the ray paths in the water layer and the rocks underneath. This module is designed to account for both ray bending effect, and the effect of NMO stretching on the frequency spectrum. Using either a constant Q value, or more preferably, a time and space-variant Q field, the required amplitude and/or phase correction is calculated and applied to each segment, before inverse transforming and merging it back into a Q-corrected trace. Figure 1: For every trace segment in an arbitrary offset, a basic calculation is performed to account for the time spent in different layers, which have different velocities and quality factors. Figure 2: Q correction aims to reverse the effects of both attenuation and dispersion on different frequencies at different times. 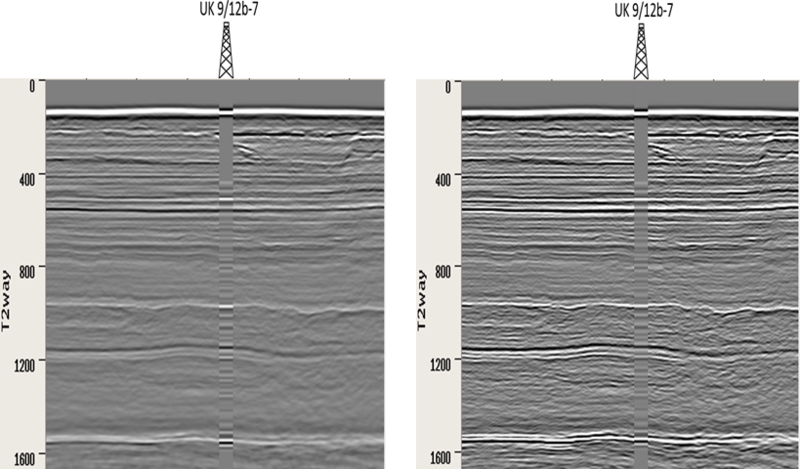 This operation improves the tie between surface seismic reflection data and synthetic data from well logs.